The Little Lake mapping unit has high wetland loss caused by shoreline erosion, subsidence, and channel construction. The project is located in an area protecting approximately 3,000 acres of fragile interior marshes between the Little Lake shoreline and Bayou L’Ours Ridge. Project area wetlands are subject to high shoreline erosion rates (20 to 40 feet per year) and subsidence deteriorating interior marshes. Without construction, the project area marsh was expected to convert to mainly open water over the next 20 years. 4) reduce land loss rates by 50 percent over the 20-year life of the project. The project consists of two major features, a shoreline protection structure and a marsh creation and nourishment area. The 25,976 ft foreshore rock dike was constructed by placing rocks on top of a geotextile foundation. The dike was constructed using three lifts and include gaps every 1,000 to 1,500 ft for fisheries access. The marsh creation and nourishment phase of this project consisted of containment dikes, marsh creation in open water areas, and marsh nourishment over existing marsh. Approximately, 920 acres of marsh were created and nourished through placement of 3,165,121 cubic yards of sediment from Little Lake. The marsh creation area was planted with 17,000 Spartina alterniflora (smooth cordgrass) plugs. 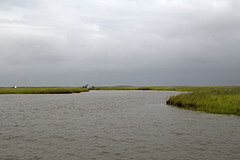 The project is located in the central Barataria Basin in Lafourche Parish, Louisiana. The project area is bounded by the East and West Forks of Bayou L’Ours and the southern shoreline of Little Lake from Plum Point westward to Breton Canal. This project was selected for Phase I (engineering and design) funding at the January 2002 Task Force meeting and for Phase II (construction) funding in November 2003. Construction was completed in 2007. The project is listed on Priority Project List 11. This project is on Priority Project List 6.
segments to facilitate material and organism linkages. westward 3 miles in Cameron Parish, Louisiana. This project is listed on Priority Project List 10.
estimated at 0-1foot/century (Coast 2050). Borrow material will be dredged from areas within Lakes St.
berm to add additional protection from wind induced wave fetch. within the marsh platform area. Lake Pontchartrain and areas surrounding Lake St. Catherine. This project is on Priority Project List (PPL) 24.